The supreme aesthetic experience is something that is sadly meaningless to a large proportion of the population. Sad it is because the visceral, emotional, intellectual thrills that can penetrate your psyche and infuse your whole body, taking it to a different plane of existence, are so profound they improve and enhance our lives, our view of the world and the things in it for long after the experience has passed. Those of us who appreciate these experiences will often go to extraordinary lengths to have them. But it is important to remember we are social creatures and the extremes of aesthetics are best experienced in the company of those who also understand. So it was last Friday. The Editor and I had arranged a little luncheon with our chum Richard Brooks. Richard is perhaps the living embodiment of charm, it is almost impossible not to like him. But more relevant to this discussion, he, as do The Editor and I, understands. We recognise those experiences beyond the rim. We had three such experiences at lunch and, by arse, did we revel in them. They were so pyrotechnically preternatural we were often completely lost for words (which is going to make writing this article hard) and resorted to sounds and gestures to attempt to articulate the magnitude of transcendence we were experiencing. If there is a god, which there is not, its powers are nothing compared to those who made the three wines that united us in radical rapture. A sniff – POW! You are thrust into its world of intense, penetrating aromas. And you want to stay in that world because it is being penetrated in a good way – through the nose and soon the mouth. Look up! Everyone at the table is transported by the electric thrills, but they catch your eye and you know they think the Coeur de Cuvee 1996 is as good and as engorged with excitement as you do. It is fresh as a daisy too, with no hints of oxidation even though it has obviously had quite a lot of contact with new oak. The nose is like having the ripest, most fragrant slice of lemon you’ve ever encountered shoved up your nostrils with a solid gold barge pole. Considering this wine is 80% Chardonnay the bargepole is studded with an awful lot of red fruits: ripe, juicy strawberries with a hint of raspberry there too. Sniffing this is enthralling, you all know it. You look around and grin, hardly able to take your nose away from the forceful, surprisingly youthful and remarkably oak-dominated set of aromas that bubble from the top of your glass. Yet you all know what you have to do. Who will be first? GO! A liquefied lemon tree thunders into your mouth, vigorously exploring every corner – a sensation that leaves you reeling. It is taut, linear and direct as it envelops your mouth with dazzlingly complex flavours of sharp fruit, wood and a suggestion of stone. It has the lightest, freshest of mousses, but this is a firm wine that gives all your teeth another spanking before diving headlong for your stomach leaving incredibly involute flavours caressing every corner of your mouth. You slowly look around. De Montille is one of the sweet, sweet homes of classically-styled, beautiful Burgundy. You can tell that from the very first sniff. Bright, fresh red fruits remind you of why you first loved Burgundy. There is a brilliant purity of expression to that fruit – it is not interfered with by any silliness with new oak, over-ripeness or alcoholic heat. This sculpted little entity does have more than a hint of stone about the nose, but really it is the sheer loveliness of the fruit that transports you. It is like you are having dinner on the balcony at Domaine Dujac after all traces of the Côte de boeuf have been cleared away. You are left alone to think for a moment, sniffing your 2001 Clos-Saint-Denis, when your reverie is interrupted by the arrival of a large bowl of freshly picked premier cru raspberries, straight from the garden and a little serving of powerfully fragrant raspberry sorbet, made from those same raspberries. You could not be in a happier place either there or just sniffing this wine. The nose, then, is an enchantment that transports you to some happy, happy place, surrounded by friends and eating the freshest, best food you could ask for. The palate deftly lifts you and your fellow drinkers even further from the, admittedly lovely, world of Winchester. You are standing next to those raspberry bushes and stoop to pick one. It is deliciously perfect. Not over-ripe but still fresh with pronounced acidity. You cannot help but dwell on the kaleidoscopic array of flavours that the privileged earth has allowed this bush to fructify. There is an incredibly intricate detail to them, they seem to illuminate your palate. You know that there is quite a lot of tannin in the skins of the fruit, in this wine that you are drinking, but it is the sophistication of those sweeter, more sapidly beautiful, flavours that capture you imagination with every mouthful. And as you swallow, those flavours last and last, keeping you in your dream world of beautiful Burgundy. But now your mouth is free, you can share a broad smile with your fellow drinkers and attempt to characterise all that you have experienced, “Lovely… Quite, quite lovely!”. To many of those whose love of wine developed contemporaneously with mine, Philippe Engel was a super-human. Through him the earth spoke and, by god, we could afford it! Contemporary encounters with his wines are a backward look at our youth, a downward look at the soils he articulated so eloquently and a glance upward at the towering figure his skills have made him become in our memories. This is a wine of the earth. Rich and complex, but subtle and supernal earth. This wine, even in its fading maturity, shouts of the fine location from whence it came and brings back floods of memories of the first time you tasted a wine from this land. There is fruit there too, but it is definitely on the soft and mature end of the spectrum and, true to the vintage, there is more of a hint of dirtiness than one might expect from an Engel wine. 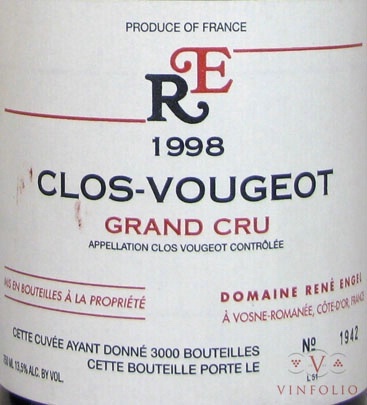 Rot was a real bugger in the Clos-Vougeot in 1998; I know, I was there. And I am there again now with the clods of rain-soaked soil sticking to everything and powerful, ripe grape aromas filling my nose; yes, sadly tainted by the hint of dirt that rot brings. It may be almost two decades away, but this nose brings that vintage right to my glass. The palate has the power and sophistication that a Grand Cru should have, although it is beginning to fade from this vintage. The earthiness is still powerful and complex, as is the fruit, though. The tannins are soft and mellow as one would hope for in a mature, ripe wine. I did not know Dani or Richard when I did this vintage, but as we revel in the class of this wine I feel I have shared the best parts of it with them. Not the aches, pains and filth, but the satisfaction at loading diligently selected grapes into a fermenter and the glory of smelling ripe Pinot that no one will smell quite like that again. Wot more Burgundy?????? I do hope you’ll be bringing a lovely Claret at September’s big boy affair at the Hawksmoor old bean! I had a wonderful Palmer 98 and L’Evangile 98, as well as a stunning Fargues 97 with the Fois gras starter on my last day in Bordeaux courtesy and that wonderful American Alex Rychlewski, a couple of weeks ago. Been the height of my summer thus far! Apart from the delightful Sauternes I am happy to report I own not a single bottle of Bordeaux. There’s just so much to despise about it. Did someone visit my off-site storage? Er, right….in my dreams. Best 3 bottle i can remember. Well done. Excellent wines. Brilliant notes. Thanks for sharing. First of all, thank you David and Dani for sharing these extraordinary wines with me. Both the Vilmart and the Montille certainly stand among my greatest ever wine experiences. It was a pleasure and a privilege to drink them with you both. My memory of this lunch will be strong for a very long time. It’s superfluous to add more than a few observations to your wonderful notes. 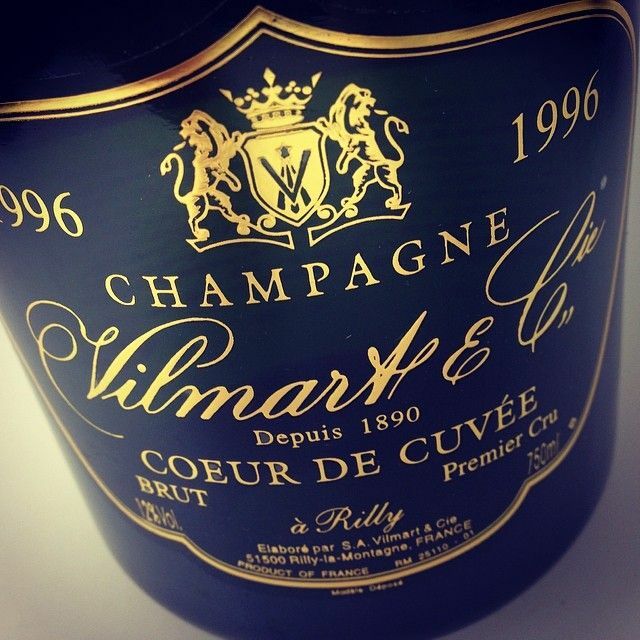 I’ve now had the Vilmart Coeur from 1990 and 1996, and they were both just absolutely incredible, with a level of sheer intensity of flavour that is unmatched almost anywhere else in the wine world, let alone Champagne. So it really does seem to me that one should buy and cellar this wine if at all possible. I was grinning like a fool whilst I drank the 96. This was my first encounter with a grand Montille other than at en-primeur tastings. It was transportingly lovely. I said at the time I thought no one really describes them very well (you corrected me that you do…), but even the people who love them didn’t manage to convey to me the deftness of the balance. The intensity whilst at the same time the absence of any heaviness. This wine had a sort of limpid beauty at the same time as seeming generous, complex and quite developed. It lacked nothing but any kind of excess. It also made my wine, the Engel, seem rather rustic by comparison. I greatly enjoyed my other bottle of this wine, on its own, with some stinky food at St Johns about six months ago. This says something about the company it was trying to keep up with at our lunch. I agree with you that it does a great job of being Clos Vougeot. As we said in conversation afterwards, this was a lunch where we lived in the moment. I’m grateful to have experienced it. Thank you all, I’m pleased you liked my notes. Richard, I think the CV was better than you give it credit for, but then I have an enormous soft and yielding spot for Engel’s wines. I purchased every vintage if Vosne les Brulees from 1990 onward, starting firstly getting them at Berry’s for an absolute pittance. The closest you can get in style and affordability these days is Confuron-Gindre – I have three bottles of their 2012 les Brulees slowly inching their way toward me and I am tempted to keep them for a very long time. I can’t add anything to the notes, I had to rip them out of my very being so intense were those experiences, but it was a great pleasure to have shared those three moments with you, Richard. I hardly noticed the food, but those three experiences we had then, when we were truly in the zone, will be extraordinarily happy memories I shall treasure forever. 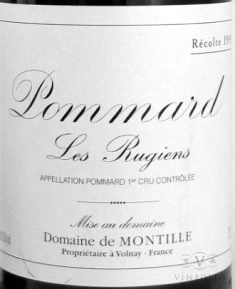 After reading your very positive 2002 Rugiens Montille review, I searched my cellar book to discover a couple of bottles of the 2002 Pommard “Les Pézerolles” by the same producer. Since it received, like the Rugiens, a positive review from “Da Hound”, this got me very excited to pop one. Would you opine that your bottle was perfectly mature or could still improve with some additional sleep? Pezerolles generally needs less time than Rugiens to blossom so I would have thought your bottle would be absolutely perfect now and not need any more time. Do report on its charms, won’t you old stick? I’m a bit surprised that the Engel tasted of rot, I have not come across this in any other 98 from this vineyard in spite of the difficult conditions, but there you go! Not a permanent condition, though, as so many 83s demonstrate now. Thank you, Tom. The Clos Vougeot didn’t taste of rot directly, it’s more that the earth flavours had moved toward being dirty, and I associate that with rot. I hope my note conveyed that it was still a great wine.